In the decade since the purchase of Manchester United by the Glazer family, the debt placed on the club has been “refinanced” four times. This week marked the latest of these refinancings. A refinancing is where old debts are swapped for new debts. They are the corporate equivalent of switching mortgages or consolidating credit card debts into a single loan. The aim is usually to make the debt more affordable, sometimes by locking into a cheaper interest rate, sometimes by extending the life of the loan, sometimes both. This post explains what United have done on this occasion. It is intended to explain what’s going on in layman’s terms. Before this latest change, Manchester United plc (acting through two of its subsisidiary companies) had a $315.7m (£206m) “Secured Term Facility” (a bank loan) with Bank of America Merrill Lynch International Limited and $269.2m (£176m) of US dollar bonds called “8 3/8% Senior Secured Notes due 2017”. There was also a “Revolving Credit Facility” (essentially an overdraft) with a group of banks. The Revolving Credit Facility has never been used. The Secured Term Facility paid an interest linked to LIBOR (a benchmark interest rate) plus a “margin” (markup) based on the level of United’s debt compared to its profits. The maximum margin was 2.75% if net debt was more than 4x EBITDA (cash profits) and the minimum margin was 1.5% if net debt was less than 2x EBITDA. This financial year net debt will be around 3x EBITDA meaning the total interest rate (using 3 month LIBOR of 0.29% and a margin of 2.25%) will be c. 2.54% per annum. The interest cost is therefore c. $8.0m or £5.2m. The Term Facility is repayable in one amount in 2019. The Senior Secured Notes are the remaining bonds that were originally issued in 2010. They pay a fixed interest rate of 8.375% per annum and therefore cost $22.5m or £14.7m. The notes are repayable in one amount in 2017. The total debt today is $585m or £382m. The annual interest cost is c. $30m or £20m. United are changing both elements of the debt and increasing the size of the Revolving Credit Facility. The Secured Term Facility, still with Bank of America Merrill Lynch, is being reduced from $315.7m to $225.0m. The repayment date is being extended from 2019 to 2025. The interest rate margin range is reduced from 1.5% - 2.75% to 1.25% - 1.75%. The $269.2m of Senior Secured Notes are being redeemed (paid off) and $425m of new Secured Notes are being issued. The new notes are repayable in 2027 not 2017. Crucially, the interest rate on the new notes is 3.79% rather than 8.375%. The total amount of debt is increasing from $585m (£382m) to $650m (£425m). The extra £43m will be available for the club to use. None of this debt requires repayment or refinancing for another 10 -12 years. Following the refinancing, the interest bill will fall from around $30m/£20m per annum to around $20m/£13m. This refinancing is an unequivocally good thing for Manchester United. The amount of debt has increased slightly but the increase provides more cash for the club. Crucially, the interest cost is now very low for a club of United’s profitablity. Even in this season of no Champions League football the club will make over £100m of EBITDA. An interest bill of £13m is therefore covered over 7x. Back in 2008 over 70% of EBITDA went on interest, next year it is unlikely to be 10%. Around 75% of the interest is at a fixed rate for the next twelve years. Even if rates rise (as they must do at some point), United will be protected from much of the impact. 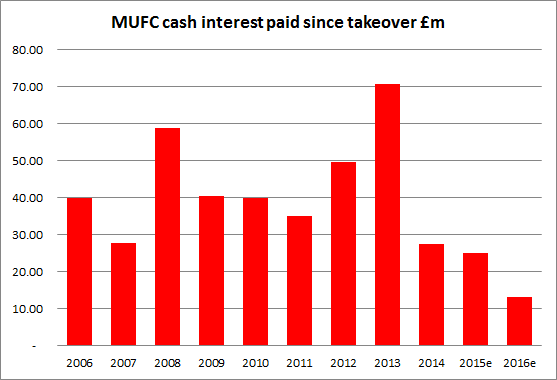 The financial story of Manchester United is no longer about the debt. It is about how effectively and wisely United spends its money.